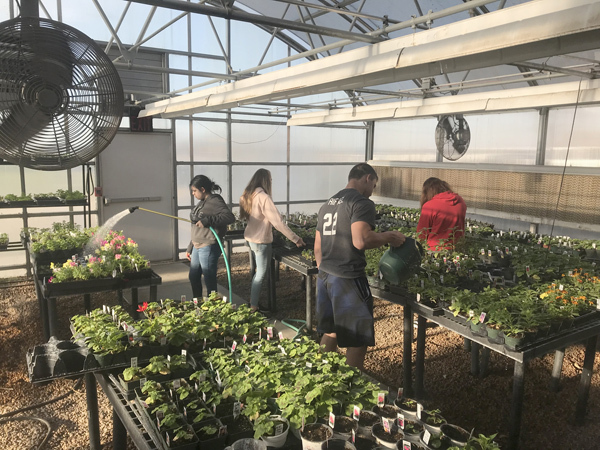 Centre High School students Jensen Riffel, Almeda Giroux, Emma David and Alexis Craney water the flowers and move plants and flats of flowers to get things ready for the spring sale. Ever since they returned from winter break, they have been working on getting ready for the warm weather and growing plants for others to enjoy. Their hard work can be seen from 9 a.m. to noon Saturday April 21. The students have grown a variety of flowers and vegetables ranging from geraniums, petunias, dahlias, different tomato plants and peppers. The public is invited to take a look at the plants, and take some home. For information, contact Jon Meyer at 785-983-4321 or email him at jmeyer@usd397.com.